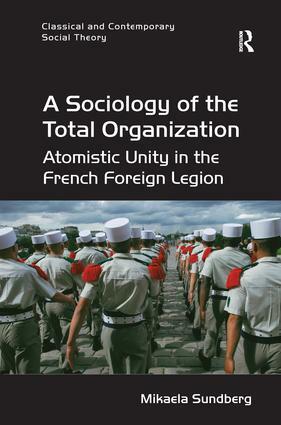 The French Foreign Legion is one of the most famous military forces in the world but up until now it has not been the subject of systematic academic attention. Mikaela Sundberg has just changed that. In a penetrating ethnography, she exposes the lifeworld of the legionnaire to critical sociological attention. The book represents a major contribution to the study of the armed forces and will be essential reading to all those interested in contemporary military transformation. Sundberg's inside view of life in the Foreign Legion shows how an oppressively controlling organization generates a mystique for its own members. Her new theory of atomistic unity explains how it functions without personal solidarity and across an international diversity of ethnicities and languages, making it paradoxically one of the most global of organizations. This wonderfully fascinating book is unique in combining classic and contemporary social theory with empirically rich ethnographic data. Sundberg makes a valuable contribution to organisational sociology through her concept of atomistic unity, which describes the social network of impersonal ties that unite members across hierarchical ranks. Focusing on the informal mechanisms of social control that operate through everyday life in the regimental barracks, she highlights practices of peer surveillance, interaction rituals, â€œgreedyâ€� ties and secondary adjustments, which create social solidarity and loyalty to the Legion.